This page provides information about one of the many invasive plants that RiversEdge West works to manage along rivers: tamarisk. 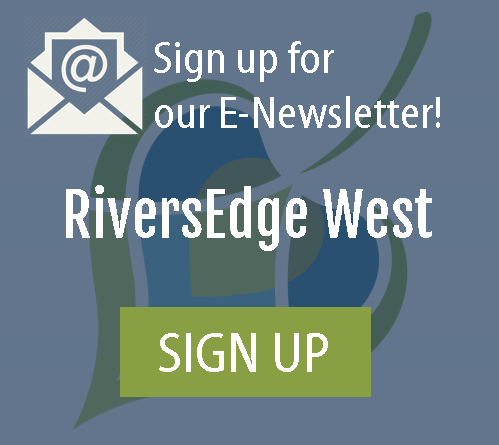 To learn more about other invasive riverside plants, visit our Resource Center. Tamarisk, also known as saltcedar, was introduced into the United States in the 1820s for its ornamental characteristics and was later used for windbreaks and stream bank stabilization. 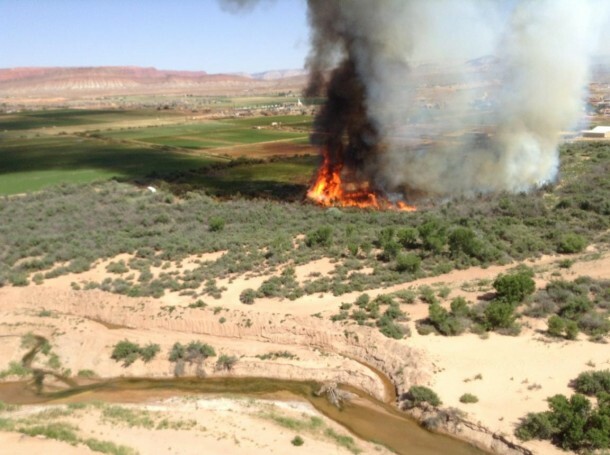 Tamarisk has since taken the place of native trees and shrubs, like cottonwood, aspen, gamble oak, willow, and mesquite and now infests rivers, streams, wetlands, reservoirs, and springs across the West. 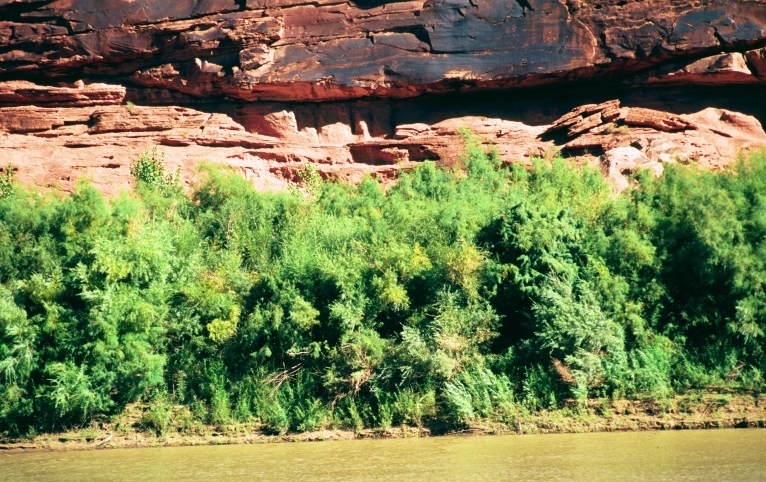 Tamarisk has since become a concern to communities and recreationists because it forms dense stands that block access to river and stream banks – areas which support a range of native plant materials and other important cultural resources. 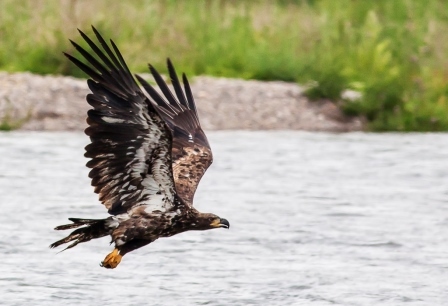 Land managers and landowners are concerned because of the loss of native vegetation that affects plant and animal diversity, especially in riparian areas. Tamarisk can be poor habitat for many types of wildlife, poor forage for livestock, and can increase soil salinity and wildfire severity. Water management groups are also concerned with tamarisk infestations along waterways because of its ability to change hydrological patterns and the high rate of water loss associated with tamarisk evapotranspiration. 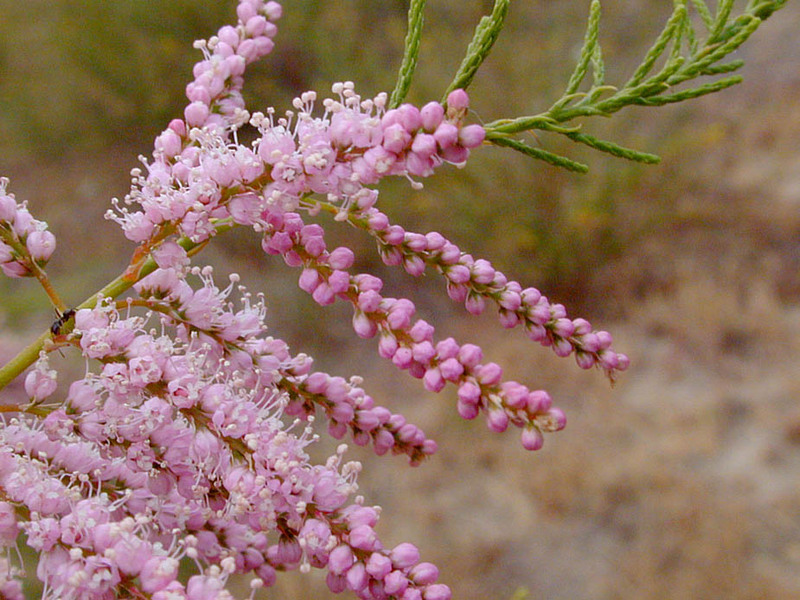 In the western United States, tamarisk is on the noxious weed lists of Arizona, California, Colorado, Montana, Nevada, New Mexico, Oregon, Washington, and Wyoming. Consuming more water—Research supports the conclusion that in a plant-to-plant comparison, tamarisk uses comparable amounts of water as native riparian plants such as willow and cottonwood. However, tamarisk tends to grow at higher densities than native riparian vegetation, and as a result, it uses more water per unit area. For example, tamarisk typically grows in very dense thickets in comparison to native vegetation and in this case, can use more water in a given area. 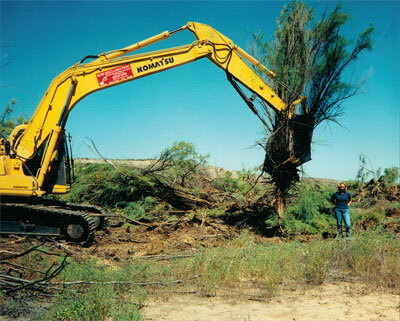 Additionally, tamarisk’s deep roots allow it to access more groundwater than most surrounding vegetation. As a result of its deep root system, tamarisk can also grow in areas farther from the riverbanks, taking the place of less water-using dryland plant species, such as sagebrush. Other contributing factors include stand density and age, climatic conditions, water availability and associated vegetation. Tamarisk is a shrubby tree that can grow to be 20 feet tall. New growth has reddish-brown bark, which darkens with age. Tamarisk leaves are scale-like with salt-secreting glands. The ﬂowers are small, bright pink to white (pictured right), and produce up to 500,000 seeds/plant throughout a growing season, usually from April to October. Tamarisk competitiveness can largely be attributed to its intricate root system. 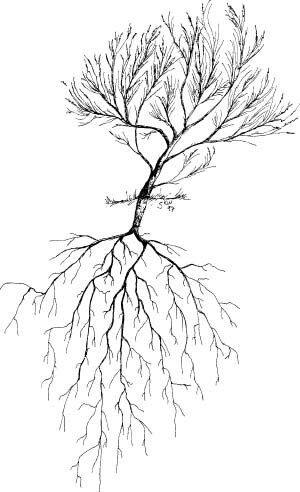 The ﬁrst root from a germinating seed grows directly to the water table, followed by profuse lateral root development. Tamarisk can tolerate higher levels of salt concentrations in soils than most native species. The deep roots in combination with the salt glands on the leaves make it possible for tamarisk to redistribute salts from lower soil proﬁles to the soil surface. Excessive salt deposits on the surface inhibit the germination of less salt tolerant native species. As the native species are crowded out, a monotypic stand of tamarisk is formed. Tamarisk is difﬁcult to control. Single treatment approaches to control tamarisk have not proven feasible because no method completely eliminates tamarisk or its regeneration. Incomplete control efforts can stimulate regrowth that increases the density of a tamarisk stand. The rate of success in tamarisk control will increase with a combination of mechanical, chemical or biological control treatments. An integrated approach that maximizes the use of local resources and takes advantage of environmental conditions will achieve the highest level of long-term control. 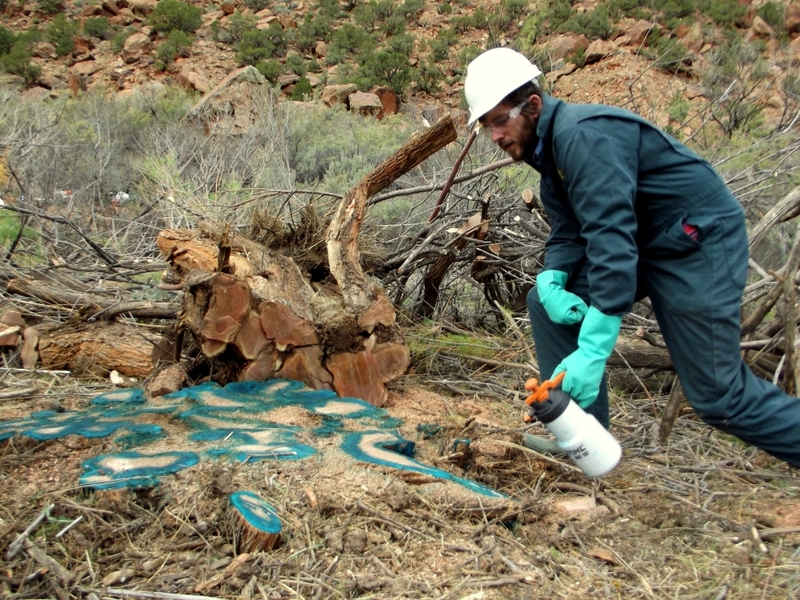 Triclopyr and imazapyr are effective herbicides against tamarisk. Triclopyr is most effective in cut stump and basal bark treatments. Trees should be cut so that the stumps are two inches above the soil surface and the herbicide should be applied within a few minutes to the sides of the stump and the cambium layer. Basal bark applications can be applied any time of the year when the bark isn’t wet or frozen. Herbicide should be applied from the ground up to 12-18″ on all sides of the stem. Imazapyr treatments are most effective as foliar applications and provide the highest rate of tamarisk mortality at levels of 90 percent or greater. Fall applications in August or September produce the highest mortality rates. Attempts at mechanical control include mowing, cutting, and root plowing. Mechanical treatments should be followed by a chemical treatment to reduce the vigorous resprouts. Debris from mowing or plowing should be gathered into piles and burned to prevent sprouting from adventitious buds. As noted above, mechanical and chemical control methods are commonly used to manage tamarisk but may have limited applicability due to landowner goals, site accessibility, size of the tamarisk stands, expense, and other factors. 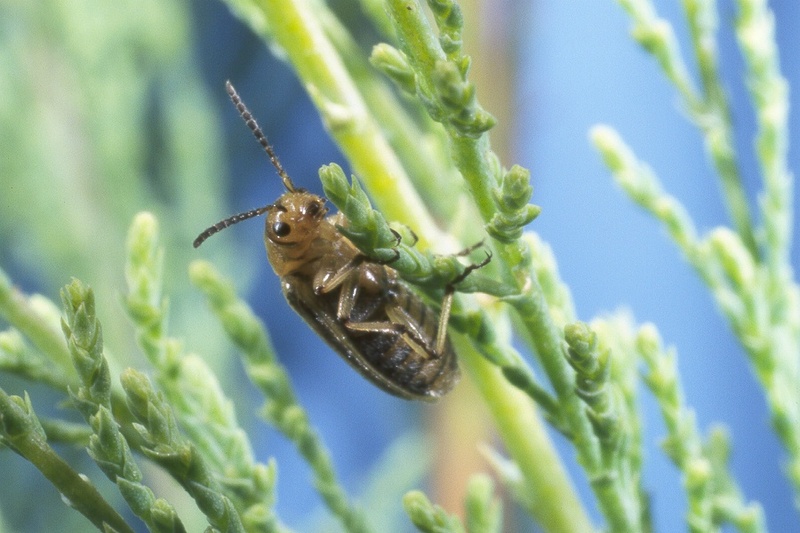 Biological control, or biocontrol, is another management tool being used to control tamarisk. The insect selected for the control of tamarisk, called the tamarisk beetle (Diorhabda spp. ), was tested by the US Department of Agriculture for over 10 years to ensure that it would be effective, and would not feed on native plants or crops here in the western United States. The beetle was first released in 2001, and today can be found in every state in the southwestern U.S. and has established populations in at least thirteen states and Mexico. What Does the Tamarisk Leaf Beetle Look Like? The tamarisk beetles are yellow-brown and about ¼ inch long. Larvae feed on tamarisk foliage (pictured right) for about 3 weeks before crawling or dropping to the ground where D. elongata pupae and adult they pupate in the leaf litter or loose soil at the base of the plant. About one week later adult beetles emerge and feed on the tamarisk foliage. The tamarisk beetle over-winters as an adult and emerges the following spring to lay eggs. Click here to view the stages of the tamarisk beetle life cycle. What Does the Tamarisk Leaf Beetle do to Tamarisk? 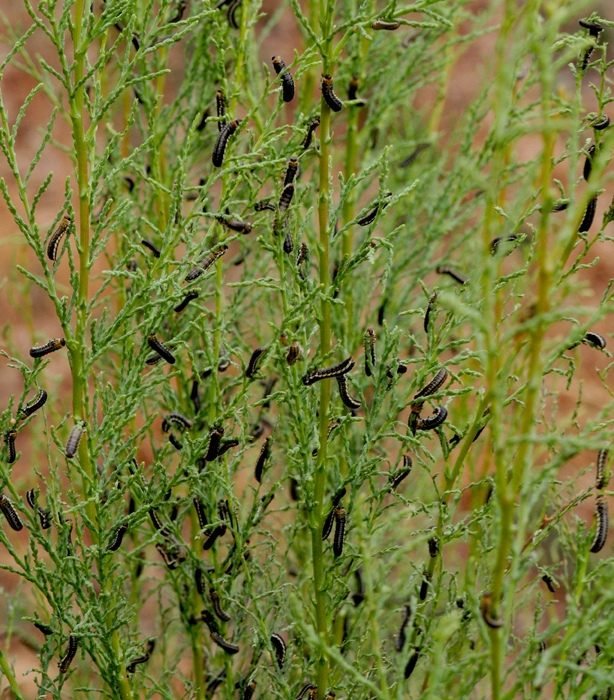 The tamarisk beetle and its larvae feed on the leaves of tamarisk, "defoliating" or "browning" the plant. Following defoliation, many tamarisk will re-sprout along the stems of the tree. Don't be fooled - browning may happen several times during a growing season, and does not signify mortality. Research indicates that it may take 5-7 years of repeated defoliation from beetle infestations depending on the location and specific micro-environmental factors of the tamarsik plant. Defoliated tamarisk may also exhibit a yellowish color which may be caused by another insect that feeds upon the tamarisk, the tamarisk leafhopper. This insect is entirely green, resembles a legless grasshopper and is about half the size of the tamarisk leaf beetle. The tamarisk beetle does not feed or develop on any plant other than tamarisk. RiversEdge West does not release the tamarisk beetle - we have been providing critical information concerning the tamarisk beetle to land managers since 2007 as part of our Tamarisk Beetle Monitoring and Education Program. Tamarisk is well established throughout the west and will require a long-term commitment of time and resources to manage. Prevention should be a major focus in tamarisk management to protect areas not yet infested. Credit: Some of the information above was produced by Ruth Richards, Ralph Whitesides, Craig Poulson, Matt Palmer, Nathan Belliston, and San Hess with Utah State University Cooperative Extension. Click here to view the informational brochure.